Who's Bill This Time Bill Kurtis reads three quotes from the week's news: "Anonymous-gate," "Supreme Fast Track" and "Egg Sue-ffle." Bill Kurtis reads three quotes from the week's news: "Anonymous-gate," "Supreme Fast Track" and "Egg Sue-ffle." 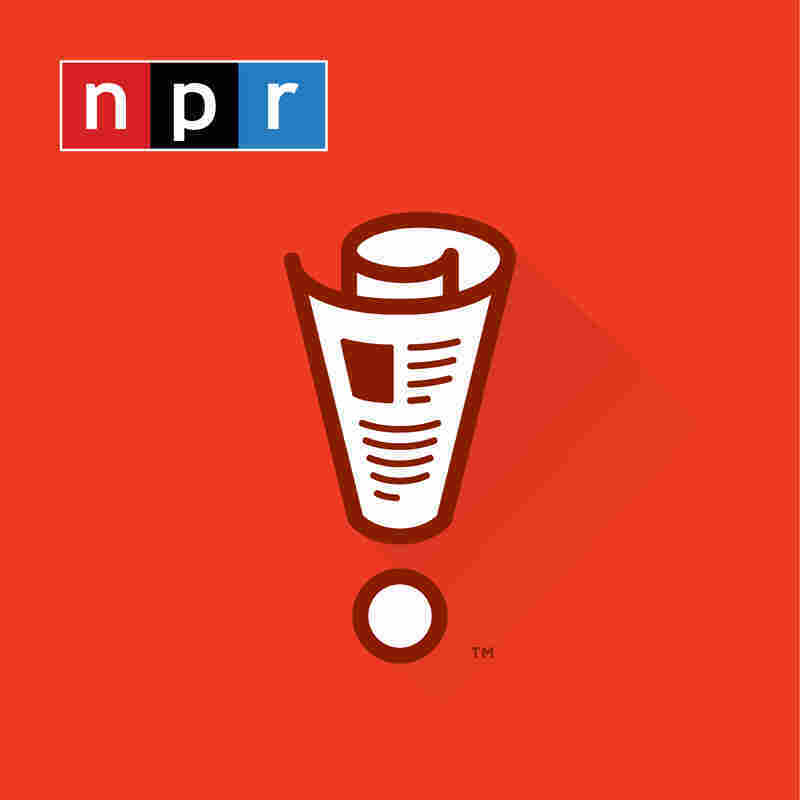 BILL KURTIS: From NPR and WBEZ Chicago, this is WAIT WAIT... DON'T TELL ME, the NPR news quiz. You're going to look great 'cause you're about to get a Bill-icone (ph) implant. KURTIS: I'm Bill Kurtis. And here's your host at the Chase Bank Auditorium in downtown Chicago, Peter Sagal. Thank you, Bill. Thank you, everybody. Thank you all so much. SAGAL: We have a very fun show for you today. Later on, we're going to be talking to the author of the young adult novel "To All The Boys I've Loved Before" that's the basis of a very popular movie on Netflix right now. However, the author has insisted on remaining anonymous, although speculation is that it's either Jenny Han or Vice President Pence. SAGAL: But first, please be aware that we will require you to state your name when you call in to play our games, although we won't check if it's real. Say anything. The number is 1-888-WAITWAIT. That's 1-888-924-8924. Let's welcome our first listener contestant. Hi, you are on WAIT WAIT... DON'T TELL ME. STEVEN VANVARICK: Hello. Steven VanVarick from Winter Garden, Fla.
SAGAL: Well, hey. How are things in Winter Garden? VANVARICK: Just wonderful - hot and rainy. SAGAL: Oh, that's what it's like, I guess, in Orlando at the end of the summer. Is that where - do they have baseball spring training there? VANVARICK: I don't know. I don't follow sports. SAGAL: You don't notice, like, every March, a whole bunch of, like, overpaid guys wandering around carrying wooden clubs? VANVARICK: I don't hang out in Orlando. SAGAL: All right. Steven, welcome to the show. Let me introduce you to our panel. First up, a comedian who will be performing at the Arlington Drafthouse in Arlington, Va., September 21 and 22. It's Helen Hong. HELEN HONG: Hey. Hi, Steven. SAGAL: Next, a comedian performing at Beauty Bar in Chicago on September 13 and a writer for WGN's "Man Of The People," it's our friend Adam Burke. ADAM BURKE: Hello, Steven. How are you? SAGAL: And finally, making her debut on our panel, a comedian whose new book is called "Maeve In America," it's Maeve Higgins. SAGAL: Steven, welcome to the show. You're going to start us off with a round of Who's Bill This Time. As I'm sure you are aware, Bill Kurtis is going to read for you all three quotations from the week's news. If you can correctly identify or explain just two of them, you'll win our prize - the voice of your choice from anyone on this show on your voicemail. You ready to play? SAGAL: All right. Now your first quote is, in fact, a series of quotes from top White House officials. KURTIS: No, I did not write. I am not the author. It's not mine. It wasn't me. SAGAL: ...All denying that they had done what? VANVARICK: The secret letter in The New York Times? SAGAL: Exactly. The anonymous op-ed in The New York Times - they say they didn't write it. SAGAL: So far, nobody has come forward to admit to being the senior administration official responsible for the New York Times op-ed calling the president, quote, "impetuous, adversarial, petty and ineffective," unquote. This is a little bit like an elf writing an anonymous op-ed saying Santa is overweight. SAGAL: I mean, we knew that. SAGAL: It's a little weird to see it coming from a guy on the team, though. HONG: I love that they've narrowed the suspects down to about 400 people. HONG: And the only person that we all know it definitely was not is Melania because we know she can't write anything that Michelle Obama didn't write first. SAGAL: Of course, by the end of the week, as we - as Bill quoted, more than a dozen Cabinet secretaries and officials have denied writing it. And you can trust them because a person who said in The New York Times that he constantly lies to the president to keep him from losing it is obviously going to tell us the truth. BURKE: ...Inescapable cliffhanger, and then you turn in next week - tune in next week and he's gotten out of it. BURKE: Like, every week, Mueller the Merciless is like, I have you now. BURKE: Is the end of Trump Rogers (ph)? No, it's not. He always gets out of it. He has his secret Russian decoder ring, and he gets out of it. BURKE: He's got the pardon pistol. SAGAL: All right, Steven, here is your next quote. KURTIS: You also apparently like to eat pasta with ketchup, but nobody's perfect. SAGAL: That was Orrin Hatch, senator from Utah, hitting somebody with the tough questions as part of his confirmation hearings. Who was it? VANVARICK: That Kanvanwho (ph) something? HONG: You were almost there. SAGAL: It's been so ubiquitous this week, I'm both shocked and a little envious that you've been able to escape it. SAGAL: You were close. You know the job, right? SAGAL: Yes, that's right. And give me your best version of his name. SAGAL: It was - Brett Kavanaugh is the name. SAGAL: You were close enough. SAGAL: I have trouble with those ethnic names myself. SAGAL: As President Trump said of him, Judge Kavanaugh does seem born to be on the Supreme Court. It's true, but I bet his black, loosely fitting, robe-like skin did cause him some embarrassment as a kid. SAGAL: I don't know if you watched it, but they were actually, unlike most Supreme Court nomination hearings, kind of interesting 'cause the Democrats decided to fight with everything they had. Good news for the Republicans - they had very little. The Democrats are not going to stop the nomination, but, boy, they sure tried. So all the Democrats get a participation medal, and Kavanaugh gets a Supreme Court seat for life. BURKE: So it's - so it's Kavanaugh, right? Well, that would depend on the particular case. SAGAL: It was kind of fun. There were these spirited speeches from the Democrats. There were outbursts from protesters. And there was so much grandstanding by Democrats, it got a little suspicious. Every time Cory Booker finished talking, he turned to the camera and said, I'm Cory Booker, and I approve that message. SAGAL: Your last quote, Steven, is the description of a product that earned its maker a huge fine this week. This is a product called the jade egg. KURTIS: This nephrite jade stone helps connect the second chakra - the heart - and yoni for optimal self-love and well-being. SAGAL: Prosecutors claim that was actually all nonsense, so they fined a woman's wellness company owned by what celebrity? SAGAL: That is a very good guess. HONG: That would make sense. SAGAL: Does the word Goop mean anything to you? SAGAL: You know, I think you're better off. SAGAL: So we'll just move on. I'll tell you. It's Gwyneth Paltrow. Gwyneth Paltrow has created a multimillion-dollar business by convincing otherwise-intelligent woman to pay 60 bucks for little rocks they put where you usually do not want rocks to go. BURKE: Is that where the phrase to get one's rocks off comes from? HIGGINS: Get your rocks in. BURKE: Rocks in - get your rocks in. SAGAL: These jade stones are supposed to, quote, "increase sexual energy, tone muscles, balance hormones and increase bladder control," unquote. Bladder control, right. Who has the focus to pee your pants when all you can think is, oh, my God, I'm about to have a rock baby? HIGGINS: No. But, like, every single woman's product sounds violent and aggressive. Like, my hair products are all, like, is your hair disgusting and frizzy and unruly? HIGGINS: Whip it into shape. HIGGINS: Get ahold of yourself, woman. HIGGINS: And so I think that's why she makes everything sound so, like, it will be fine. Just, like, drink this oil, and, you know. SAGAL: Is your reproductive tract barren of minerals? BURKE: Would you like to turn your uterus into the set of an "Indiana Jones" movie? BURKE: Put some precious stones up there and be a hero. SAGAL: ...Indiana Jones trying to get out, and the stone is coming after him. SAGAL: That would do it. SAGAL: That would definitely do it. BURKE: I'm meeting resistance that I haven't come across since I went on that spelunking trip. HIGGINS: I'm finding myself between a rock and a hard place. SAGAL: Bill, how did Steven do on our quiz? KURTIS: Well, Steven, you got 2 out of 3. You are our winner.